Inspired by one of Earth's oldest species, Nancy Nelson crafts these brass earrings with teal patina. Leaves like tiny Japanese folding fans, pure green in summer, a shock of yellow in fall: The ginkgo tree is one of the oldest species on Earth. Inspired by this ancient beauty, Nancy Nelson crafts her stunning set of brass earrings. 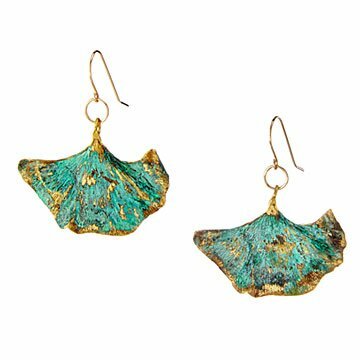 She adds a vibrant teal patina to each metal leaf, giving depth and detail to your ensemble. They're a unique, expertly crafted gift for those who love to be spend time in nature. Handmade in Maryland.